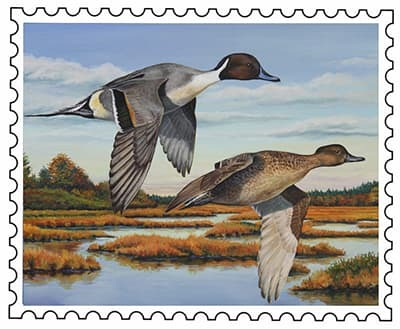 In 1984, the Maine Department of Inland Fisheries and Wildlife [MDIFW] instituted a state duck stamp program modeled loosely after the federal duck stamp program: the stamp was required by hunters 16 years and older, and all revenues from the sale of duck stamps (about $13,000 - $16,000 annually) are dedicated to the conservation and management of waterfowl in Maine. In 2002, MDIFW discontinued the duck stamp requirement of hunters, but instead required the purchase of a waterfowl hunting permit on the hunting license. 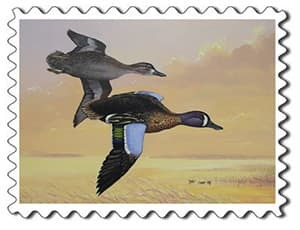 Duck stamps still are available for purchase by collectors, and revenues from the sales of both the stamp and the waterfowl hunting authority are dedicated to waterfowl conservation programs in Maine. 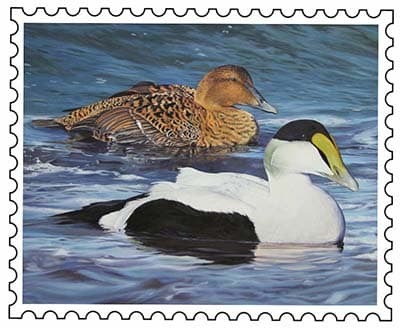 Each year, the Department holds an art contest to select the artwork for the upcoming waterfowl stamp. Judging takes place each spring at the State of Maine Sportsman Show in Augusta. We know these projects can be time consuming, and the time and effort that goes into each piece we receive does not go unnoticed. The species for 2019 will be Canada Goose. The contest will be held on March 29, 2019 at 5:00 p.m. at the Augusta Civic Center.